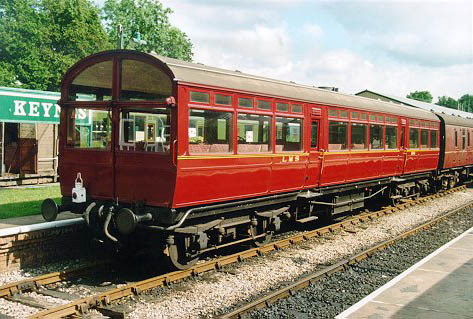 The LNWR Observation car, in LNWR livery, 2 April 2007. 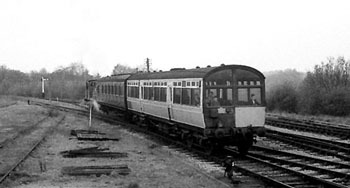 Built as one of three Observation Coaches for the scenic route between Llandudno and Blaenau Ffestiniog, it ran on this line until displaced by diesel multiple units in 1958. It was subsequently retained for a few years for driver training (a use to which it has also been put on the Bluebell!). This coach has almost certainly run the highest mileage of any on the Bluebell. Apart from its overhaul between 1979 and 1982, it has been in almost continuous use, commanding a supplementary fare. 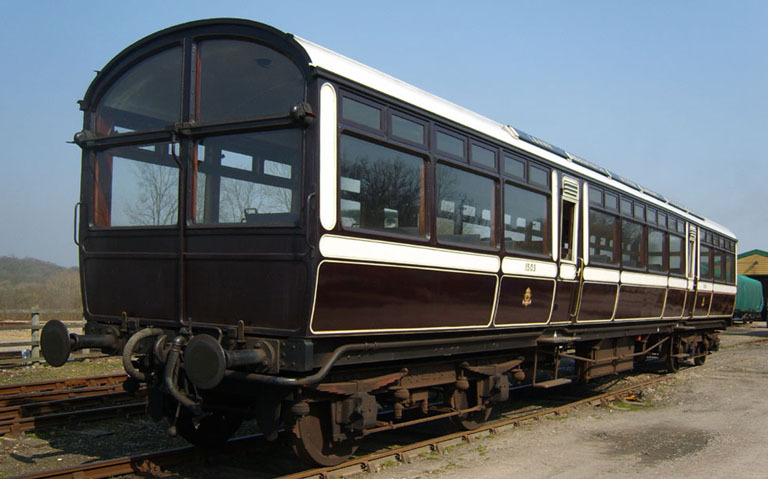 Although a humble third-class vehicle, its intricate livery, reversible seating and panoramic windows make it a popular vehicle, and one of the most unusual coaches in preservation. Its overhaul was (and remains today) probably the biggest coach overhaul project in UK preservation carried out entirely by volunteers. The body of the coach was lifted from the underframe, which itself required major repairs. An entire new floor, including the main structural bottom side members (with countless mortise joints), was constructed. New doors and windows were also fitted, and the vehicle repanelled in the original style. 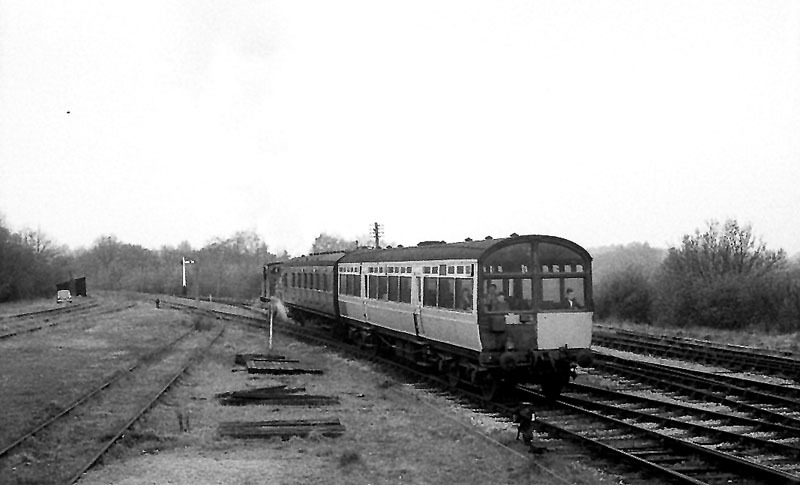 The LNWR Observation car, in LNWR livery, as restored in 1982. Two years after its return to traffic it was "highly commended" in the first ARPS (as it then was) Coach of the Year competition, being beaten only by our own newly out-shopped Maunsell open third, No 1309. During the autumn of 1998 it received a new roof covering, and replacement of some of the plywood bodyside panelling. Due to shortage of time and also the fact that it will require further heavy maintenance work in the next few years, it was painted in LMS period 3 livery as No.15843, and is seen as such in the photo above. This was also appropriate in that it was usually to be found attached to the set of carriages which we maintained for a time in BR maroon livery. 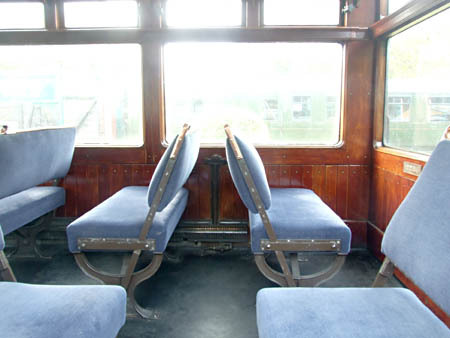 In 2004 the remainder of the defective bodyside panelling has been attended to in the course of a heavy intermediate overhaul, which also involved the replacement of all the glass in the windows with safety glass, the re-trimming of the seats in a blue corded moquette, and an internal re-varnish. On 31st July 2004 it re-entered sevice once more carrying its original LNWR livery. 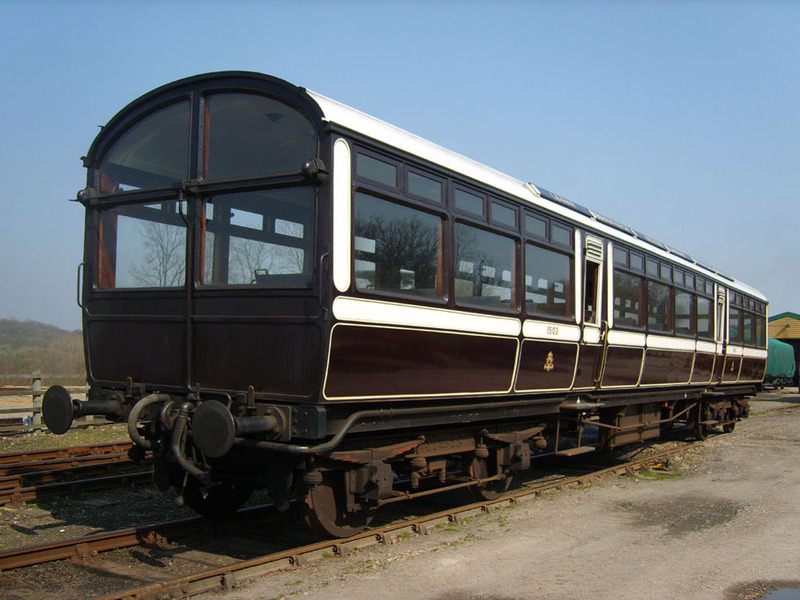 For more information about the LNWR, see the LNWR Society web site. Below is a photo of the interior of the coach, showing the reversible "tram-type" of seating enabling passengers to choose the best view during their journey. Further interior photos are available here.